Born April 18, 1979, Lexington, Kentucky. B.A. in History from Transylvania University, 2001. J.D., Washington University in St. Louis School of Law, 2004. Editor, Journal of Law & Policy, 2002-2004. M.B.A., University of Kentucky Gatton School of Business, 2009. President, MBASA. 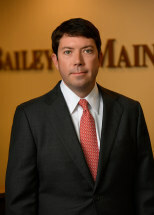 Member of Fayette County and Kentucky Bar Associations. Admitted to practice in all courts in Kentucky and United States Courts for the Eastern and Western Districts of Kentucky. Areas of focus include civil litigation, insurance defense.